It is not very often that you get to smoke something unusual in the world of cigars; the bulk of the smokes out there mainly comes from the 4 main producing countries (Cuba, Dominican Rep., Nicaragua and Honduras). You get the occasional tobacco leaf thrown in from countries like Ecuador, Mexico, Cameroon, the US, Brazil –for wrappers, but not only- Indonesia –mainly binders and the odd filler leaf from places like Peru, Costarica, and so on. I’ll admit that this is a rough generalization, but you rarely see Ecuadorian puros out there. So when I got the chance to get my hands on an Indonesian puro I just couldn’t pass. The cigar in question is sold under the brand Tambo and is made from all Indonesian tobacco grown in the island of Tambolaka. It is ironic that I need to stress that the tobacco is actually from Indonesia, but as with Cameroon wrappers, the name Indonesian or Sumatra tobacco is used to describe the variety of the leaf and not where it comes from and nowadays a large part of the so called Sumatra leaf comes from Ecuador. These were kindly provided by Ferydegiri, who is the exporter for Tambo Cigars, to some of the members of the UK cigar forum, so thank you for the opportunity to test these. At first looks this small stogie is slightly rustic in the way it is rolled, but the toothy wrapper leaf has a nice oily sheen which is quite promising. At the touch it feels a bit dry and light, and the pre-light draw, quite loose, confirms my impression that this cigar is not packed with filler. Still it is not spongy or bumpy, like many underfilled cigars are, so no issues there. Once light the first notes are of coffee and nuts, but rapidly these fade away and the cigar becomes smoky (think wood burning in the fireplace), which remains a characteristic note throughout. With that I get some vegetal notes and a touch of sweetness. The burn is perfect and there’s plenty of chewy smoke produced. From the middle point onwards, the sweetness remains just a hint and pepper notes progressively increase to become quite strong in the last third. There is also a definitive tannic feel to the smoke, which makes me think these could maybe age a bit and become even better. 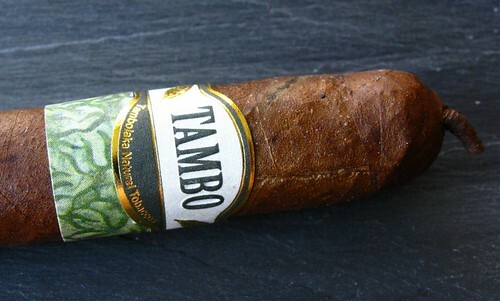 All things said and done, the Tambo Petit Corona is an enjoyable cigar, simple maybe but one that has no faults and definitely has its own character. Without knowing what the price point is, it is hard to say if it is worth its price as I generally do, but I can safely say I wouldn’t mind smoking a couple more when I am in the mood for something on the light side but still tasty. This entry was posted in Cigar Reviews, Indonesian, Short reviews and tagged Cigar Review, Indonesian cigars, Tambo. Bookmark the permalink. Just thought that you’d like to know roughly what the retail price of a Tambo PC would be in the UK (so that you can comment on whether it is worth it or not)… You would be looking at roughly £7 (I’m currently looking into importing some of Ferry’s products). cool to hear that you are working to import some of the Indonesian cigars … some variety in the UK market is more than welcome in my view. I don’t think the price is too high considering the UK tobacco-tax system, but it does present the same issue that other NC face i.e. that the UK is mainly a Cuban market and at that price you have a few Habanos PCs in the same range and it might be hard to win market interest because of that. I don’t think it is fair to be honest, but I know from discussions with other cigar smokers here in the UK that many would go for the Cuban 9 out of 10 times unless the price is more convenient. One thing I think would help to get some interest would be to have something like a sampler box for people to try; personally I hate the fact that here in the UK it is hard to find something like that wich is well established in the US and possibly one of the best ways to try new stuff. Having said that, I really wish you all the success with this!